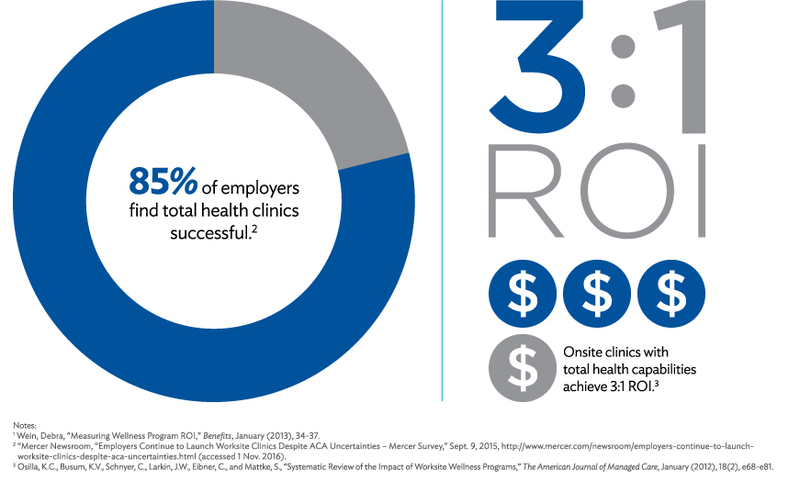 Total Health Clinics offer a holistic approach to treating employees. Onsite clinics that offer primary care and wellness services in addition to occupational medicine increase the value of providing healthcare at the work site. Primary care services include acute care, preventative care and disease management. Addressing the "whole person" enhances the opportunity to create a healthier workforce, which in turn becomes a safer workforce. Strong primary care services are associated with improved quality of care and reduced medical costs. Onsite or near-site clinics shorten the distance between patient and provider, making it more convenient and less costly for employees to access care. Bringing high quality customized care that fits your space, culture and business strategy.